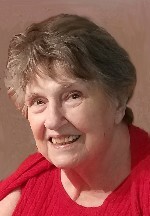 Betty Lois Pearson, nee St. Clair, 82, of Belleville, IL, born August 9, 1935, in Clinton, IA, passed away Wednesday, August 8, 2018, at St. Paul’s Senior Community in Belleville, IL. Betty was a loving and devoted wife, mother, grandmother, and great-grandmother. She loved spending time with her family and was an avid Cardinals baseball fan. Betty was preceded in death by her husband of 63 years, Robert E. “Bob” Pearson, whom she married on August 14, 1954, and who passed away on June 17, 2018; her parents, Norman and Elsie, nee Passick, St. Clair; two brothers, Charles and Richard St. Clair; and two sisters, Maxine “Mac” Harris and Joan Luckritz. and nieces, nephews, great-nieces and great-nephews. Memorials may be made to St. Augustine of Canterbury Catholic Church, to Heartland Hospice, or to the charity of the donor’s choice. Condolences may be expressed to the family online at www.rennerfh.com. Visitation: Friends may visit from 9 to 10 a.m. Monday, August 13, 2018, at George Renner & Sons Funeral Home, Belleville, IL. Funeral: Memorial services will be held at 10 a.m. Monday, August 13, 2018, at George Renner & Sons Funeral Home, Belleville, IL, with Msgr. William McGhee officiating. My deepest sympathy for Betty's family. I first met Betty playing Mah Jongg at Scott AFB in 1994! We then reconnected in 2006. She was a wonderful woman who always had a kind word. I am so sorry to hear that Betty passed away. She was such a wonderful lady and I loved playing Mahjongg with her each week before I moved. I have thought about her frequently and still miss our Mahjogg days. Betty was one of the First Ladies I met at Scott AFB where we played Mah Jongg together for many years. I will miss her a lot. My deepest sympathy to her whole family. Mike, Marlene and family. Bob and I are so sorry you all have to go thru this again so soon. We will miss Bob and Betty. You all are in our prayers.